TCD finance professor says that gold can act as an investment safety blanket in rough economic times. Some of the gold bars owned by Irish investors in GoldCore's London office. 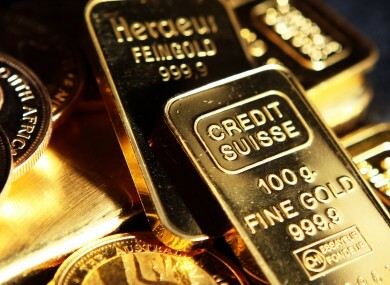 IRISH INVESTORS OWN over $95 million (€69 million) worth of gold in vaults in Zurich, Hong Kong, Singapore and Perth, according to gold broker GoldCore. GoldCore looks after the gold investments of over 3,600 clients. Head of research Mark O’Byrne said that his average client investment is worth around €40,000. Trinity College Dublin professor of finance Dr Brian Lucey said that gold can provide stability to a pension fund. O’Byrne urged Irish people to invest a portion of their pensions in gold as a hedge against volatility in other assets, including bricks and mortar. He argued that gold has recovered from a big slide in 2013 after the peaks of 2011 when the Eurozone Debt Crisis drove the price of gold has high as $1,900 (€1,376) per ounce. Gold prices fell 26 per cent last year. O’Byrne said that there had been a “very, very sharp correction, but we do believe it’s a correction in a wider long term bull market”. O’Byrne said that investors should diversify around ten per cent of their portfolio into gold, which traditionally holds or increases value during rough economic times. Cautioning that the financial crisis has not necessarily passed, he cited high levels of personal indebtedness, the vulnerability of the US recovery and the ongoing threat of more Eurozone turmoil as headline issues that could threaten investment values. Email “Irish people own €69 million in gold”. Feedback on “Irish people own €69 million in gold”.